Everything for the Business End of your BROTHER and then some. BROTHER DB2-B101, DB2-C101 & DB2-C111 Range A very popular range of High Speed Flatbed Lockstitch Machines from BROTHER. Sold in the UK as the DB2-B755 Mk3A. Continuing the tradition of using the B755 Model Number. Good Quality Machines deserve good quality parts and needles. Never compromise - CALL US. Need a Part For Your BROTHER DB2-B101, DB2-C101 or DB2-C111 Industrial Sewing Machine ? Then you are in the right place. 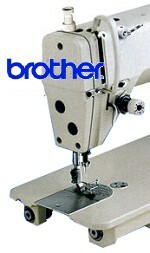 We have been supplying BROTHER Machines for over 20 years and we know them inside out. Call Us for Expert Advice and Quality Service.